Dear sub-licensees and followers of the Teachings of Grigori Grabovoi! 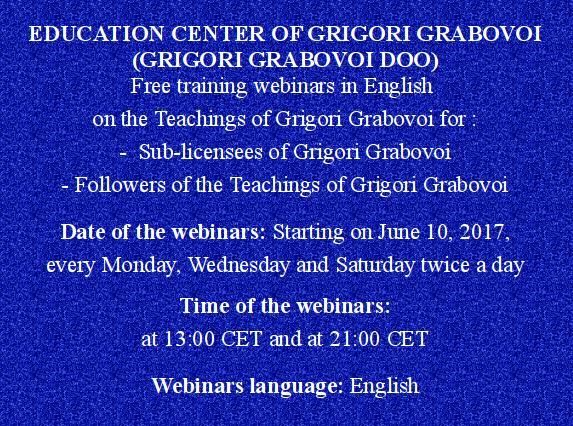 Starting on June 10, 2017, we begin holding free English-language training webinars for sub-licensees and followers of the Teachings of Grigori Grabovoi! Webinars will be held every Monday, Wednesday and Saturday twice a day: at 13:00 CET (19:00 Singapore time) and at 21:00 CET. • to learn about the practical results of practicing the methods of Grigori Grabovoi by the teachers. The topics of the webinars will be communicated additionally. Chers sous-licenciés et abonnés aux Enseignements de Grigori Grabovoi ! À partir du 10 juin 2017, nous commencerons par tenir des webinaires d’entraînement gratuits en Anglais pour les sous-licenciés ainsi qu’aux abonnés aux Enseignements de Grigori Grabovoi ! Les webinaires seront tenus chaque lundi, mercredi et samedi deux fois par jour: à 13:00 CET (19:00 Heure de Singapour) et à 21:00 CET. – de vous informer sur les résultats pratiques de la pratique des méthodes de Grigori Grabovoi par les enseignants. Les thèmes des webinaires seront également communiqués. Dear friends from the US! We are making schedules for free webinars, and would like to make it friendly for the US followers as well. Please, let us know, YOUR preferable time in your time zone. Would it be suitable to have lessons on 19:00 LA time / 22:00 NY time? Monday, Wednesdy, Saturday (4:00 CET). The programme will be the same in all time zones. We will also try to add some other days in due time. Chers amis des États-Unis ! Nous préparons les horaires pour des webinaires gratuits, et nous aimerions les créer amicalement pour les abonnés des États-Unis, faites nous savoir, VOTRE heure préférable dans votre fuseau horaire. Serait-il approprié d’avoir des cours à 19:00 heure de Los Angeles / 22:00 heure de New York ? Lundi, mercredi, samedi (4:00 CET). Le programme sera le même dans tous les fuseaux horaires. Nous allons aussi essayer d’ajouter d’autres jours en temps voulu. FORTHCOMING FREE WEBINARS IN ENGLISH – SCHEDULE!!! You should have the account at the website of pr.grigori-grabovoi.world to be able to enter the webinars. You create the account only once and you can use it every time. – On the right side of the screen you will find the green box CREATE YOUR ACCOUNT. Follow the instructions and create your account. It is preferred to use for the “username” small letters with no spaces. – You will get an e-mail to activate you account. YOU SHOULD REPLY TO THIS E-MAIL to active you account. 1. Left click on the mouse in the link above or copy – paste the link above on you web browser. 3. Register to the page with your registration data. 4. After successful login you will appear in related Live Webinar. • Approved appearance of the POP UP page (for browsers use on PC) because console for managing Webinar opens as a pop up window. Find the notification of the blocked pop up and UNBLOCK IT. You also should ALLOW the Adobe Flash Player. • Your browser should support Flash 11.2 version, we always recommend the latest version FLASH technology. • Recommended internet speed is 1 Mbit / s download and 1Mbit / s upload. • Recommended hardware – dual core processor and a minimum of 2 GB of RAM. • For the Share Screen option the Java runtime should be installed. The check is performed on the Java test page. It is the user’s choice, whether to approve a pop-up only for the address for the WebCollab PLUS applications or to all applications. On the Internet, you can find enough information to set POP-UP options on your computer. It is also recommended that you “clean” your computer for the: startup optimization, registry clean, registry defrag, disk scan, privacy sweep, spyware removal, junk file clean, internet boost, vulnerability fix, shortcut fix, system optimization, disk optimization. There are many tools on the internet for this to. If you do not do that, your computer might work too slow to follow the speed of the live webinar stream. We are not responsible for any possible delay or failure to appear on a live webinar from your side in any case. Detailed user guide of Webinar tool you can study on grigori-grabovoi.world website.